Win 1 of 3 double passes to the advance screening in Toronto tomorrow, March 1st @ 7pm. First 3 people (with different IP addresses) to comment below win passes! There must be a way to contact you such as a Twitter account, e-mail or Google + tied into an e-mail address. With all this mild weather in the GTA, yesterday was another spring-like day. It was so warm and sunny, that we took a walk around our local pond. Notice the lack of snow in many of the photos. Burrs stick to everything--watch out! WIN Advance Screening Movie Passes to Project X on Feb 23rd in MONTREAL or HALIFAX! 6 pairs of tickets total to win, 3 pairs of tickets per city! How to WIN:1.Leave a way for us to CONTACT you in the COMMENTS form below, either through a Twitter id (ie: @SnyMed), Google + account (linked to e-mail) or e-mail address. 2.Follow US on Google + OR Join the SnyMed blog OR Follow @SnyMed on Twitter...and COMMENT how you followed. WIN 1 of 4 pairs of Advance Screening Movie Passes to see The Best Exotic Marigold Hotel on February 23rd, in Toronto! (Giveaways for other cities are still running, so see past posts!) Winners will be contacted either Feb 22nd. Make sure you leave us a way to contact you! 1.Leave a way for us to CONTACT you in the COMMENTS form below, either through a Twitter id (ie: @SnyMed), Google + account (linked to e-mail) or e-mail address. WIN Goon Double Advance Screening Movie Passes for Victoria, Regina, Saskatoon, St. John's, London, Kingston, Hamilton, Waterloo & Halifax (3 passes available for each city). Most screenings are on Feb 22nd, but Halifax & St. John's are on Feb 20th. HOW TO WIN: In the COMMENTS form below, just enter the CITY you would like to win tickets for & a way to CONTACT you on Twitter, Google + or via e-mail. Tickets will be awarded on a first-come-first-served basis. Would you? Would you follow on Twitter via @SnyMed (middle right button) OR to join the SnyMed blog (top right button) OR to add SnyMed to your Circles (middle left button)? Thanks! WIN 1 of 14 pairs of Advance Screening movie tickets to see Act of Valor on Feb 23rd! SnyMed has tickets to give away to the following cities: Toronto (5 pairs), Ottawa (3 pairs), Halifax (3 pairs) & Victoria (3 pairs). Would appreciate a follow on Twitter @SnyMed (middle right button) OR to join the SnyMed blog (top right button) OR to add SnyMed to your Circles (middle left button). An Interview with Zwap.com: great Canadian deals...and FREE gift cards! I interviewed Sandy from www.zwap.com, a hotspot of Canadian deals. Read on to learn how you can receive a FREE Tim Horton's gift card from Zwap--just for joining the Zwap.com community! SnyMed: Sandy, how would you describe Zwap.com? Zwap: Zwap is a Canadian website that features forums focusing on Deals, Contests, Coupons & Freebies. You can find everything on Zwap from the latest sales at your favourite retail stores, to dozens of weekly grocery & retail flyers, to endless coupons for food, personal needs, household goods, to offers for free products and services, as well as hundreds of fantastic contests. Zwap is literally a one-stop shop! SnyMed: Tell me more, Sandy! Zwap: I have a wonderful community of members (affectionately called Zwappers!) who contribute fantastic content to Zwap on a 24/7 basis. I have gone from a membership of one (me!) to a membership of over 2300 in just over a year. Zwap is a very family-friendly website. Besides the aforementioned benefits of being a member of Zwap, I also offer Zwap Rewards where members can earn retail gift cards for posting content on Zwap. I even provide a $2.50 Tim Horton's gift card just for becoming a member on Zwap. SnyMed: When was Zwap first founded? Zwap:Zwap was founded on November 14, 2010. SnyMed: How does someone join Zwap? Are there any fees? Zwap:It is very easy to join Zwap. My website address is www.zwap.com . In the top right hand corner of the page you will see a place to sign up. It only takes a couple of minutes to join. Once you have joined you will receive a confirmation email asking you to confirm your membership. That's it! There are no fees to join Zwap. Upon becoming a member on Zwap, you need to message me "Handler" (my nickname) with your name and address so that I can send you out your Tim Horton's gift card for joining Zwap. SnyMed: Zwap has a pretty great reward system! Please describe it a little bit. SnyMed: Providing gift cards for member participation must be costly! How do you do it? Zwap: In 14 1/2 months, approximately $10,000 has been spent on Zwap (just in gift cards alone). Zwap does not have any sponsors. Zwap has very recently started earning a tiny amount of income (mere dollars a month) from Google Ads. SnyMed: What are your biggest challenges with Zwap? Zwap: My biggest challenges with Zwap have been keeping up with the distribution of the rewards cards to members, as well as making sure I respond to members' comments, concerns and questions in a timely manner. I strive to keep on top of both but sometimes, due to the workload on Zwap or due to issues in my personal life, things can fall behind. SnyMed: What do you consider your biggest successes with Zwap? Zwap: One of my biggest successes with Zwap would be that I've managed to grow the membership from just myself up to over 2300 members in just over a year. Another one of my successes with Zwap comes down to the relationships I have with my members. A third success is that I strive to post some of my own content on Zwap on a daily basis. I spend some time each day looking for content that I hope my members will enjoy and benefit from. I couldn't speak of my successes with Zwap without giving kudos to my wonderful members. SnyMed: How do you see Zwap in one-year’s time? In 5 years? Zwap: I have high hopes for Zwap. I think Zwap already has a solid foundation of great members and will only continue to grow into a bigger and better website, with more and more good things to offer members. Right now, Zwap is a small fish in a big pond. But, I don't focus on the competition. I strive to make Zwap stand out from the rest and invite everyone to join me on my journey. There are many exciting changes planned for Zwap in 2012...so stay tuned! ~ALL TICKETS HAVE NOW BEEN GIVEN AWAY, THANKS!~ Many more giveaways for Canadian cities to come. 1.Follow @SnyMed on Twitter (middle right button) OR this blog (top right button) OR add SnyMed to your circles (middle left button). Please COMMENT on HOW you have followed! 2.Put a comment below with the CITY you would like to win tickets for & a WAY TO CONTACT YOU (it can be your twitter name, e-mail--or e-mail through Google +...just make sure it is linked to your e-mail. Everytime SnyMed has chosen winners, many do not leave a way to contact them, and a different winner has to be selected. WINNERS will be contacted very quickly! Recently my husband and I were discussing if a 100% electric car would be suitable for our lifestyle. With gas prices as high as they have been, perhaps this is something you have considered too? So, we looked at the Nissan Leaf , which first came to mind as they had recently won the 2011 World Car of the Year award. We liked that fact that a 100% electric car would mean never having to buy gasoline. (To fill our minivan, we are currently paying about $110 per fill up!) And because an electric car has no tailpipe, it gives off no emissions. Definitely wonderful news for the planet, the air we breathe and the sky! How far could a car like the Nissan Leaf really drive, we wondered? Would it get us to work and back? Could we drive across Canada? Could we drive up to a cottage? The answer is that the Leaf on a full charge can travel 160 kilometers. We did the math, and 160 kms was more than we would require for daily needs. However, it would be insufficient to travel "off the grid" and drive somewhere distant like a cottage--at least for now. Next the question that everyone has been wondering: how much does it COST to charge the Leaf? We were floored to learn that to charge the Leaf from empty, costs only $2.50! $2.50? Yes, about the price of a coffee...to charge a 100% electric car! In our travels, we found a great Nissan Leaf Forum run exclusively by Leaf car owners. We located a thread discussing what Leaf owners pay on their electric bill. It is definitely worth a read if you want to be amazed by how little these car owners are paying! For an even bigger shock, compare your car's current gas bills to what you could be paying by going electric! There are practical considerations when considering the purchase of a 100% electric car. How long does it take to charge your vehicle? When you are out on the road, where do you "power up" if your battery is low? To fully charge the Nissan Leaf's battery (from empty) takes approximately 7 hours on a 208-240V home-charging station. A standard electrical outlet will take double that time to charge...or more. We have heard said even 18 hours! In certain geographic areas, 480V quick-charging stations are able to provide an 80% charge in under 30 minutes. Unfortunately, this infrastructure is not properly developped in Canada yet. So for now, the home-charging station is the only option. There are no real options to charge the vehicle on the road, unless you find a conventional electric outlet--and have hours to spare. How about the cost to buy the Nissan Leaf? The price ranges from $38,395 to $39,995. Currently, customers in Ontario and Quebec are eligible for rebates of $8,500 and $8,000, respectively. So, although there is a generous rebate, the Nissan Leaf is a car for people who are willing to pay to "go green". At least for now. And it is worth noting that many dealerships in Canada do not sell the Leaf, as the dealer must also have equipment to repair said vehicle--and be certified for the same--before being allowed to do so. Apparently this specialized equipment runs in the millions. And what about torque? We were surprised to learn that the Nissan Leaf has surprisingly good torque: 207 lbs per foot, with 100% torque available at 0 RPM! The Leaf even beats some high end performance cars at speeds from 0-40 mph! Amazing but true! Lastly, how would a 100% electric car measure up the our family's daily needs? Well, one downside for us is that the Nissan Leaf has seating for 5 passengers--and our family has more than 5 members. Most conventional cars have seating for 6. Obviously this is not a downside for families of 5 or less, who comprise most of the Canadian population. So it was decided, if we were to ever get an electric car, it would be solely used for our commute to work--and not used as a family car due to the seating limitations. In summary, my husband and I loved the low cost to charge the Leaf, as opposed to the price of gasoline. We were thrilled by the prospect of having a car that gives off zero emissions, for a healthier planet. And the Leaf's amazing torque really did impress us! However, at this stage in our life we require a car that seats more passengers. But more importantly, we require a way to charge our vehicle when we are on the road. So for now, we will pass on a 100% electric car...but will consider a compromise of a hybrid electric and gas car! SnyMed is giving away 2 pairs of tickets (4 tickets in total) to This Means War in Montreal today, Feb 7th @ 7:00pm. The next 2 people in Montreal to comment below, each win a pair. Would love for you to join the SnyMed site too on Google Friend Connect (top right), or follow @SnyMed on Twitter (middle right). WINNERS: All 13 winners have now been contacted--congratulations! Some winners have been difficult to contact, as there is no e-mail listed on your Google+ page. If that is you, please leave a comment below asap to claim your tickets. In the event that tickets are not claimed by Monday evening, we will draw new winners. WIN Tickets for 2 on Valentine's Day to see Titanic 3D in theaters! Tickets are available in Vancouver, Edmonton, Calgary, Ottawa and Montreal! There are 3 pairs of tickets to be won by city, except for Vancouver (1 pair of tickets). 1 pair per winner. How to Win: Win 1 entry for every task you comple, below. You can do one or all tasks, your choice. MUST comment below to say which task(s) you have completed. MUST say which city you would like tickets for! Winners will be contacted this weekend. 1.Follow this blog on Google Friend Connect (click button at top right of screen). 2.Follow @SnyMed on Twitter (button at middle right of screen). 3.Tweet about the giveaway: "I entered to win Valentine's Day movie tickets to see Titanic 3D on the @SnyMed blog, you can too! http://snymed.blogspot.com/2012/02/win-tickets-for-2-on-valentines-day-to.html "
4.Add SnyMed to your Circles on Google + (top left of page or add: https://plus.google.com/u/0/stream?tab=G#116414942755936896844/posts). Entering Facebook contests is a great way to win BIG! Depending on the contest, the odds are winning can be higher than usual. Why, you may ask? The reason is easy: Facebook contests are difficult to find, and therefore receive less entries than usual. I won an iPad2 last year in the very first Facebook contest I had ever entered! But why are Facebook contests so elusive? Believe it or not, Facebook contests are not searchable on the web--or even on Facebook! So how to find these secretive beasts? Doing a web search of Facebook contests will call up sweepstakes either listed on contest sites, or on the website of the company running the contest--ONLY if they have posted details there. Then how to get overcome this obstacle? Here is a Facebook Promotions app that helps you find SOME of the contests listed on Facebook: http://apps.facebook.com/promotionshq/?ref=ts You find it by typing "Promotions" in the Facebook search box. See pic below of what it looks like. You are able to search contests by the most popular, most recent, top prizes or ending soon. If you are looking to win a specific prize, such as a car, vacation or tv, you can try searching that too in the app's own search box. I like this app very much, but I find that it is not easy to identify contests being offered to Canadians (or other non-Americans). If you get creative with the search, you may find some, but definitely not all. If you are a US resident, you will go NUTS with this app. 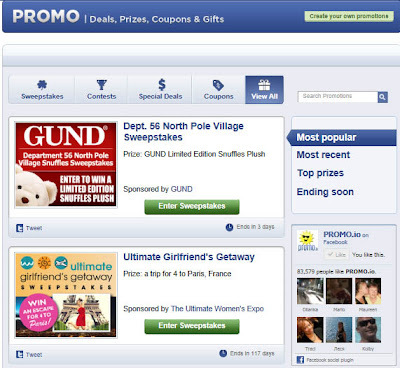 The Promotions app on Facebook - a good place to find Facebook contests! WIN tickets for 2 to see The River Advance Screening in Toronto, this Monday February 6th at the TIFF Bell Lightbox! This is a paranormal thriller, premiering on CTV February 7th, so see it first! SnyMed is giving away 3 pairs of tickets! How to win: Follow @SnyMed on Twitter or follow this blog on Google + (top right corner of this blog). For an extra entry, follow both ways. For a bonus entry, tweet about this contest with a link back to the contest page. POST a comment below so I know by which method(s) you have entered! Winners will be contacted this weekend on Sunday, so check your e-mail, as the show is on Monday! If you are not in Toronto, don't worry: on Monday SnyMed will be having a Valentine's Day contest for different Canadian cities. 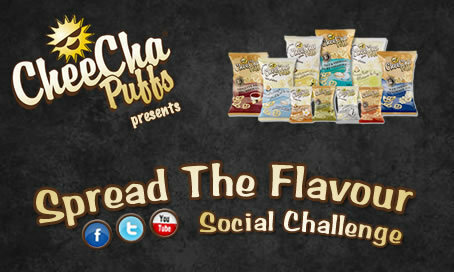 (Canada): "All you have to do is email us at info@cheecha.ca and we will send out a coupon with a message letting your friend know they have received a CheeCha-gram." Must include e-mail OR address of a friend. (USA): "Please email us if you want us to share some Gluten Free CheeCha Puff love in the US. tracey@cheecha.ca "
What does 10 years of marriage mean? To me, it is a reflection of 10 years gone by, and foresight of the next 10 years . My husband and I first met at work 15 years ago, when we had both just started new jobs. I remember his smile, his friendliness. He was such a young, fresh face, glad for his chance at a new career. I felt the same way: my first real job! He came over to my desk on lunch hour to introduce himself, which was a big gesture for him. He brought me over a submarine sandwich for lunch--without even asking--which I thought was generous. We began to take short walks together outside during our breaks and started a friendship. He looked so young, that I thought I a relationship would not be possible. I was wrong: he was only one year my junior. That was just the start of our relationship. Little did I know at the time, that I would take a romantic trip with this young man, buy a house with him, get engaged, then married, and have 5 wonderful children together. After 10 years of marriage to my husband, he is just as friendly, smiling and generous as the day I first met him. What will the next 10 years hold if the first years are any indication? Foresight tells me more friendship, smiles and generosity! Happy Anniversary.